Le VPN Giveaway for our 7th Birthday: Win a PS4! 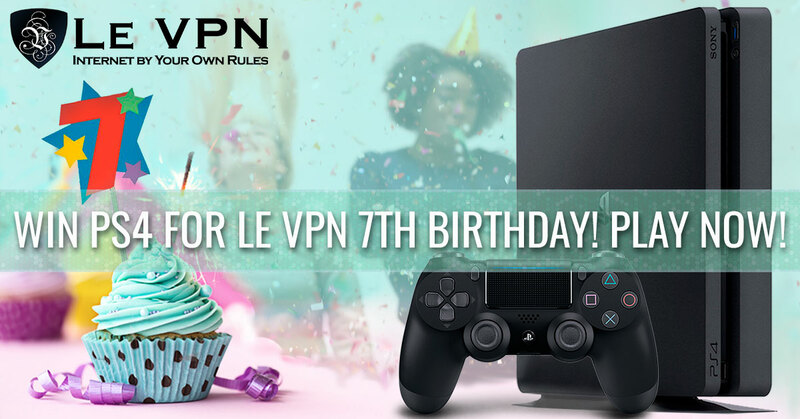 On November 10th Le VPN is celebrating it’s 7th Birthday with an exceptional Le VPN giveaway running for 7 days only: a chance to win a PS4 and have it delivered to your door step! Don’t miss this exceptional opportunity and play now! Le VPN giveaway for our 7th Birthday: Your chance to win a PS4! Seven years is a long time and Le VPN keeps on going strong, providing internet security solutions via its Le VPN apps and software to clients all over the world. Huge THANK YOU goes to all our clients, many of whom have faithfully been with us from the very beginning of this adventure and keep us motivated to serve them better and improve our service every day! How did we decide to celebrate these 7 exciting years? By thanking all our clients who help us succeed with a Special Offer and an Exceptional Le VPN Giveaway during the 7 days of our Birthday celebration! The rules are very simple: wish us a Happy Birthday here or on social media, connection with us on various networks, share your opinion on our service.. Every entry counts! The more entries – the more chances to win! The lucky PS4 winner will be announced on social media on November 17th! Stay tuned! And if you are the lucky winner – we’ll make sure to contact you to ask for your delivery address, do not worry! What else do we have prepared for you for our Birthday celebration? 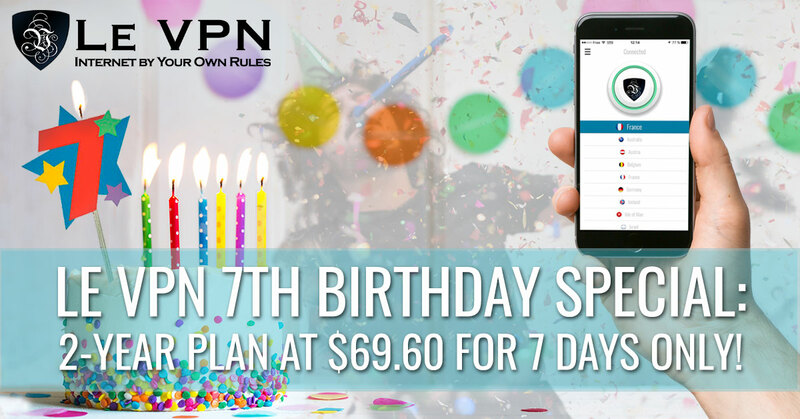 The Play Station 4 will go to only 1 lucky winner, but all of you can take advantage of our Birthday Special: 2-year plan for only $69.60 or only $2.90/month! Le VPN Birthday Special is valid for 7 days starting from November 10th and is running along our Le VPN Giveaway Competition. Where did we come from and what have we achieved in 7 years? Le VPN was born in Paris, France, on November 10, 2010. It was founded by a team of information security experts who were protecting Fortune 100 companies in France and abroad. During the boom of the Hadopi law in France (against P2P download) they witnessed people’s growing concerns about their Internet activities being monitored by government agencies, and saw an opportunity there. They decided to start protecting Internet connection and online activities of private individuals like you an me, by creating this startup that they called Le VPN which simply stands for “The VPN” in French (or “The Virtual Private Network”). Back in 2010 Le VPN offering was very basic, what is now called an MVP (a Minimum Viable Product). According to the Lean Startup movement, we started Le VPN with offering our service to Internet users in France through VPN servers in only 5 countries with only 2 security protocols. The great feedback of our first clients validated our MVP test and inspired us to grow further! As we saw that more and more people were looking to protect their internet activities and stay anonymous online, even those based outside of France and not influenced by the recent law, we decided to go global. Slightly over a year after its creation Le VPN moved its headquarters to Hong Kong and brought an INSEAD MBA to its executive team to start the international expansion. The strategic location in Asia plus numerous virtual teams in Europe and the Americas allowed Le VPN to become a truely global VPN provider, and to provide almost a 24-hour client services in 5 languages. Today, 7 years later, Le VPN has servers in 114 countries, and serves clients in 5 major European languages (English, French, Spanish, Italian and Russian) from 160+ countries around the world. 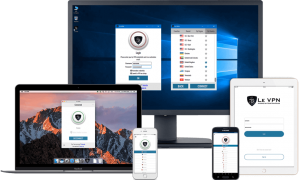 This last year 2017 was marked by the launch of our new Le VPN software for Windows and Mac, as well as Le VPN apps for Android and iOS, offered with a free 7-day trials. Didn’t try them yet? Get them now and let us know what you think! Supported by a growing number of happy clients, Le VPN team keeps on growing and adding more services and innovations to Le VPN offering. The number of its security protocols greaw in 7 years from two to five, including a ground-breaking HybridVPN connection that was released in the beginning of 2015, on the top of a SmartDNS service launched in October 2014. What does Le VPN service look like today at the age of 7 years old? 800+ VPN servers in 114 countries. Unlimited switches between the servers and unlimited traffic. No additional fees for additional servers, everything is included in one all-inclusive Le VPN plan. Custom-made Le VPN software for Windows and Mac, available in 5 languages. 4 major security protocols: OpenVPN, PPTP, L2TP/IPsec, IKEv2 plus a HybridVPN. Smart DNS service to automatically unblock all major online TV channels and media services in the US, UK and France. 2 simultaneous connections from two different devices. Growing support team, assisting clients in 5 major European languages (English, French, Spanish, Italian and Russian). Lots of payment options available (including Bitcoin and alternative methods) and a 7-day money-back guarantee. Le VPN also offers ones of the most competitive prices on the market, with its Le VPN plans starting from only US$4.95 per month with a 7-day money-back guarantee and a flexibility to cancel any time. Plus, all the new innovative solutions developed by Le VPN and the new releases that come out a few times a year, are always proposed to existing clients free of charge and are automatically upgraded in their plan. Want to testify about your Le VPN experience? Feel free to do so in the comments below or on our social media. Celebrate our 7th Birthday with us! Try to win Le VPN giveaway of PS4, take advantage of Le VPN Birthday Special and Enjoy the Internet by Your Own Rules! Great service! Works smootly for me to get past geo-blocking. Congrats! Great VPN with no problems since purchasing over a year ago. Keep up the great work! Great VPN with almost all countries. Works fast and fine. Cheap solution. Happy birthday. It’s really wonderful! Really good job! I would like to use it because of its security and big server list. Wishing the best VPN service a happy birthday! Hey, guys! Congratulations on the seven years! I hope Le VPN keeps on growing its users and keeps on providing the protection that has made it stand out from the pack. Haven’t tried LE VPN, but would consider in the future. Happy Birthday! happy birthday and many to come! I want to use it cause i dont want to leave traces. Privacy today is so important. One slip and your finances can be screwed beyond belief and the years needed to fix or longer are shot. VPN services by legit companies are a god send. I’ve NEVER experienced a downtime although I am using different locations each time, so to keep it short and sweet 😉 …. Awesome I haven’t used this VPN yet, but it will help me access netflix and pandora to listen and watch my favorite tv shows! happy birthday and I absolutely love Le VPN. Amazing, brilliant. wish you to last long and make profit along they way! I like you software and also the protocols which you use . J’aimerai tester le VPN car j’ai vraiment besoin d’un VPN. Bon anniversaire et merci à tous ceux qui nous permettent de rester anonymes. Congrats on the 7-th anniversary and wish success to your team! Would like to try it to get some extra security for my computer. I haven’t tried this product yet but I think it’s a nice way to protect you and your computer. As a matter of fact, privasy in nowadays is a huge thing!!! Best wishes from me keep the good job and HAPPY BIRTHDAY! Le VPN is very cool, happy birthday to you ! Congratulations and happy birthday Le VPN! Amazing ! Happy Birthday Le VPN! VPN is an important aspect of internet privacy and Let VPN helps deliver that! Excellent! I love Le VPN and thank you so much for creating it! Happy birthday! I love the different options to help myself feel secure on the internet. Bon chance! Happy 7th birthday and best wishes for continued success. Happy Birthday you guys rock! Great and fast service! I love photography so much and it is my passion, but I don’t have a DSLR and y birthday wish is to own a DSLR camera. Le VPN is just NICE! And I know what I’m saying, I tried so many services. The price is okay, they have a realy fast Connection and a lot of Countries to choose. Happy Birthday and go on! Happy Bday!!! YOu are great!! VPN with many many countries. Happy birthday LeVPN !. Great stuff! I’m looking into it. It’s so cool that y’all have been around for 7 years. Happy birthday! I’d like to try LeVPN for the added security and anonymity. Happy Birthday! Happy Birthday Le VPN – you are the best! Happy Birthday! Been using your service for over a year now, top level! 7 years on the market. That’s a nice achievement. Consistency is what make VPN’s trustworthy. Thank you guys for unlocking a whole world of geographically restricted content, my language skills have improved a lot since I’ve started using Le Vpn, you even have Iceland! Great service and reasonable price, thank you, thank you, THANK YOU! Happy 7th BIRTHDAY! Woohoo! Congrats! Question sécurité, le “Réseau privé virtuel” (VPN) est probablement la meilleure solution. Security issue, the “Virtual Private Network” (VPN) is probably the best solution. You’re so awesome and thank you for the awesome giveaway. Have a great Christmas and eat a lot of cake!!!! Great service and good job! Fab fab fab! Happy Birthday! Happy Birthdat LE VPN!! I hope you have a great Day with many more birthdays to come!!! Good job, and happy birthday. I would like to wish a great and happy birthday! Awww. Your 7 already? (Sigh) They grow up so fast. I really love using Le VPN, Happy 7th Birthday! I will be 100% honest and admit That i have never heard of Le VPN before but now that i have found you i will be sure to check you out. wishing you a very happy 7 birthday and hoping you have many more yrears of success! P’tain 7 ans …. d’autres y sont déjà passés. HAPPY BIRTHDAY!!! Le VPN is always reliable and I’m so glad you’ve made it for 7 years. Dear all! Thank for all your Birthday wishes and for participating in our Birthday giveaway! It was really a blast and over 2500 of you have participated, which made the competition for a PS4 really tough! Our random draw found its winner and that is Cristian from Barcelona, Spain! Congratulations Cristian!! !